This Artisan Bread is a pretty easy to make rustic bread made from 3 ingredients and great for everyone to plan cheap meals. 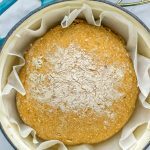 From the Dutch oven, this healthy bread made with buckwheat flour is naturally vegan and the easiest no knead recipe. Now you know what it’s like to be a baker and make the best gluten free bread at home. Just combine flour, dried yeast, water, olive oil, and salt in a bowl. Mix all the ingredients with a wooden spoon – no need to knead it, just mix. Now it’s time let the dough rest for at least 15 hours in a warm place with a plastic wrap foil on top. So I recommend you make the dough the night before you want to bake it. Preheat the oven to 430°F with the Dutch oven inside to allow it to warm. I would say it should take about 15 minutes until it’s warm. Use parchment paper or sprinkle a bit cornmeal on the bottom. Form the dough into a ball with your hands, then put it into the Dutch oven and sprinkle a tiny bit of flour on top. Cover with the lid and put it into the oven, bake for 20 minutes. Remove the lid and bake for 10 minutes more. Take the bread out of the Dutch oven. Let cool completely before slicing.